This family had two tweens that needed their own bedrooms, and a home-based furniture business involving a lot of bulky inventory. They desperately needed more space! 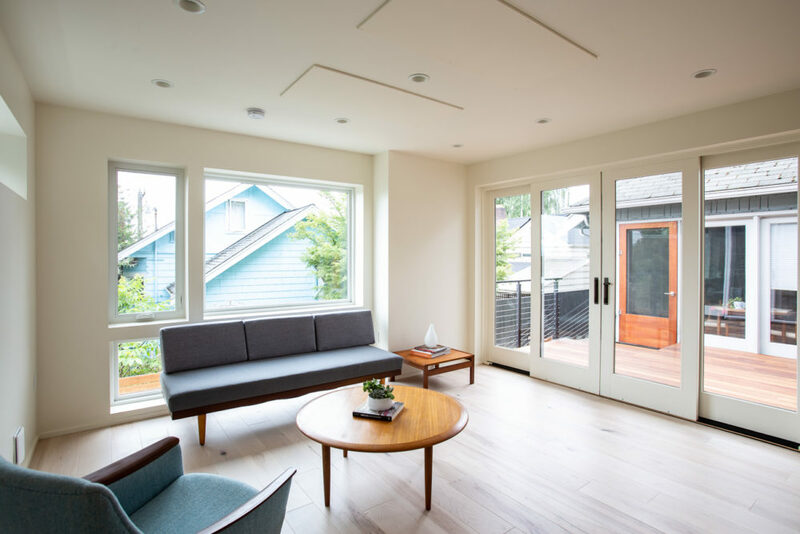 An innovative, 2+ story DADU (Detached Auxiliary Dwelling Unit) significantly expanded available living space, without tackling the structural challenges of increasing the existing home. Living Shelter Design Architects and Mighty House Construction collaborated on this project to include super energy-efficient building solutions; emphasizing healthy finishes for superb indoor air quality. Plus, it’s Built Green 4-Star Certified! 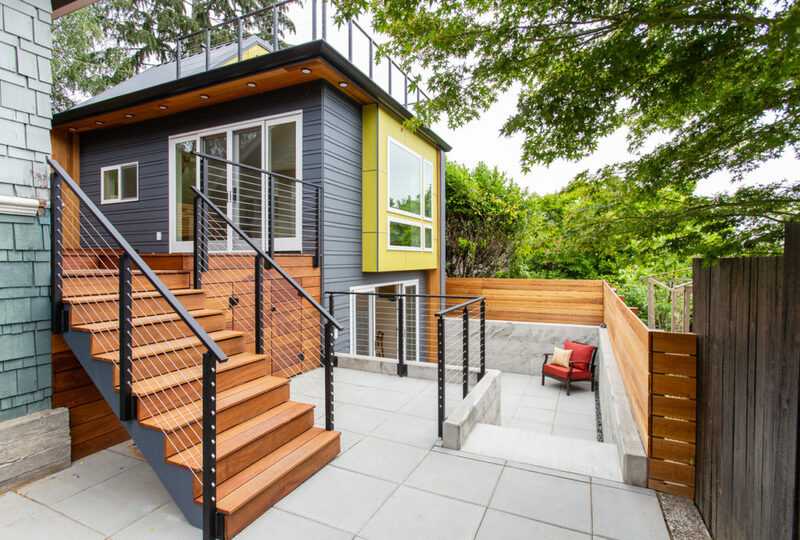 With total living space under 800 square feet, the expense of installing ductwork or a heat pump system just didn’t make sense. Instead, we chose cozy and efficient infrared radiant ceiling panels. Heated by an electric infrared coil, these units radiate energy down — heating the people and objects in the room directly. Spaces warm up faster & stay warm longer with very little electricity and zero maintenance, and no dust or allergens being blown around. Provided by Mighty Energy Solutions. 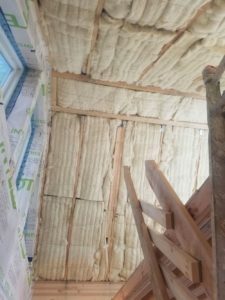 The DADU’s walls are filled with Havelock Wool insulation, and air sealed with “vapor smart” membranes. These membranes create an air barrier, but also allow trapped moisture to escape from the wall system. Sealing leaks in the building envelope is one of the best ways to improve energy efficiency and get the best performance out of your insulation. Havelock Wool insulation is as eco-friendly as it gets – it grows on sheep! Provided by 475 Building Supply. 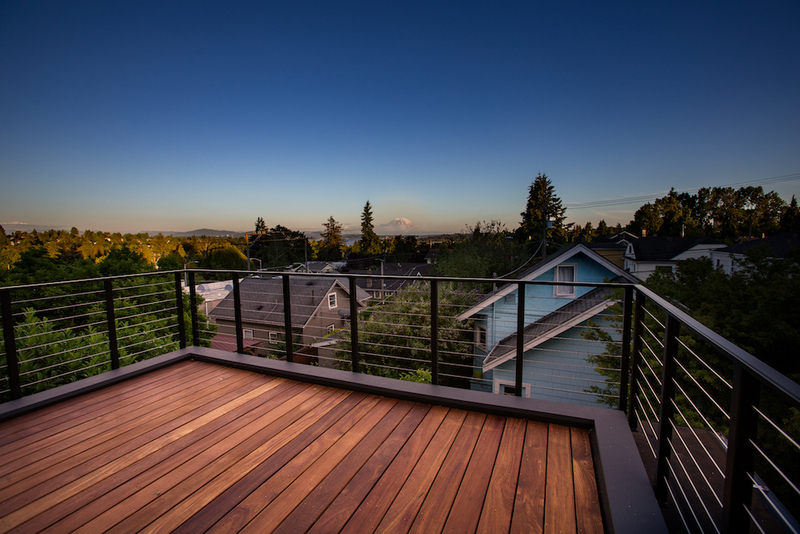 Flexible, multi-use spaces help maximize square footage with a below-grade first level. 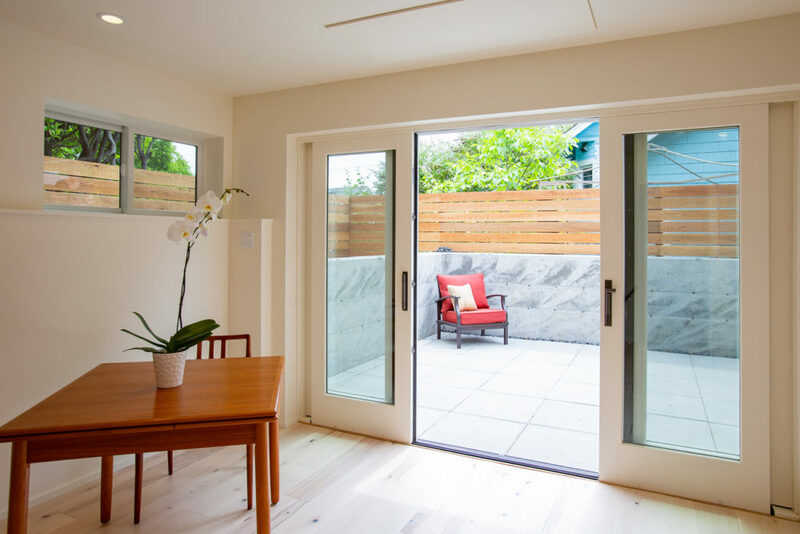 The sunken patio and french doors, bring generous amounts of natural light to the DADU’s interior, and provide use of outdoor living spaces. 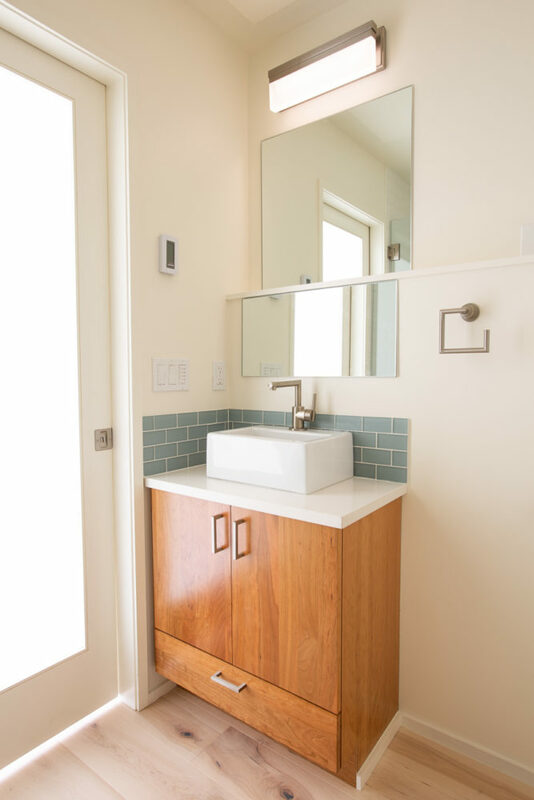 Recycled glass tile is produced on the West Coast by Oceanside Tile and Fireclay Tile. In 2103, Fireclay was the first company to recycle panel glass from CRT (the first 1/2” section of optical glass used in older computer monitors and TV sets) and incorporated it into an innovative line of lead-free glazed, glass tile. Oceanside provides 30% pre-consumer recycled glass content in their products. 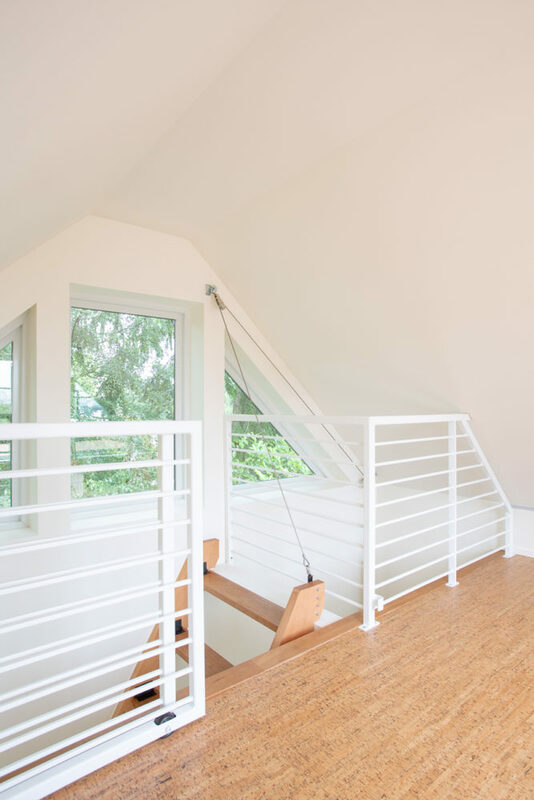 The light shelf provides roof deck access and additional light in the stairwell and kitchen. 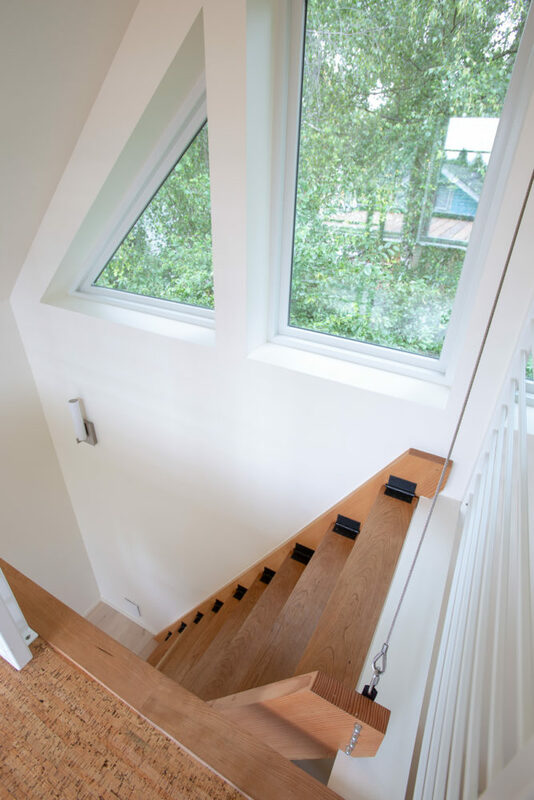 Access to this top floor was custom designed by Living Shelter Design. This simple and innovative ladder uses a weighted pulley system to easily fold against the wall when not in use. When open, it is safe to climb and just as sturdy as a set of stairs. Cork flooring is a rapidly renewable resource, as well as a sound and thermal insulator. This material is also anti- static, hypo-allergic, and completely impermeable. Other flooring in the DADU is FSC Certified Maple, which is plantation grown. It contains zero added urea-formaldehyde and zero VOCs (volatile organic compounds) adding to an even healthier indoor environment for occupants. Provided by Greenhome Solutions. Plus, a pretty breathtaking view of Mt. Rainier! See more photos in our Flickr Gallery.